German Showdown: Audi RS5 vs BMW M4 vs Mercedes-AMG C63S! - Muscle Cars Zone! German Showdown: Audi RS5 vs BMW M4 vs Mercedes-AMG C63S! 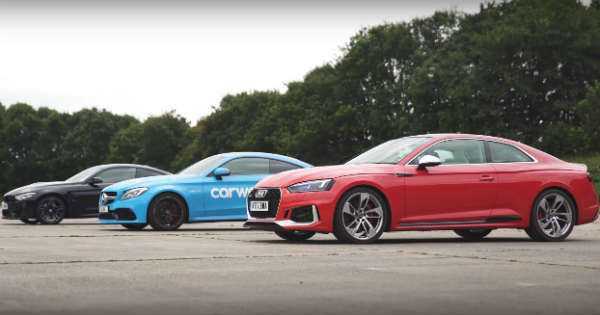 Carwow are back with yet another insane drag race with three awesome German cars -- the new Audi RS5, the Mercedes-AMG C63 S and the BMW M4. They invited Supercar of London`s Paul Wallace to race them with his M4. Now, on paper, deciding where to put your money should not be a very hard task. Our car comparison tells us that the C63S is powered by a 4L V8 producing 503HP and 516 pound-feet of torque. The BMW M4 on the other hand is powered by a 3L inline six that`s capable of delivering 453HP and 442 pound-feet of torque. However, judging by our car comparison, the Audi RS5 looks like a complete underdog. It features a 2.9L V6 that delivers “only” 443HP and 442 pound-feet of torque. However, like with every obvious thing in life, there is a catch in here as well. The new Audi RS5 is the only car of the three to boast 4×4. Would this system make a huge difference on the ¼ mile? Well, when the standing drag racing comparison is considered, the Audi RS5 manages to blitz the two other cars off the line. But, the C63 managed to close half the gap and finish in second place. This is exactly what we expected to happen. Anyway, Mercedes fans will be more than happy to witness the C63 executing the two other cars in a rolling race. In this one, the Audi RS5 finishes dead last. Even the M4 had a much better engine response. Having said this, the Audi RS5 is one awesome car for launching. However, it`s way slower when it comes to the real world. Finally, click here to check this 1000 horsepower Audi RS6 DTM! Just WOW!